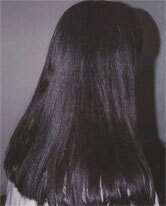 A beautiful healthy hair is soft, smooth, strong, shiny, fast growing and manageable. Physical, environmental and chemical factors can damage a healthy hair and convert it to a dull, fragile, rough and out of control hair. Environmental factors are sunlight, dry and hot air, and pollutants in the air. Mechanical factors include hair bands, combs and hair brushes. Chemical factors are bleaches, dyes, shampoos and other materials used to style the hair. In this project you investigate to see how bleaching and dying may affect the hair. You need samples of human hair for this experiment. You may optionally use a magnifier or a small microscope to observe visual effects. To measure the strength you need to build a device or assemble a special setup.